They herded us like cattle. We walked, single file, through a maze of metal barricades. The dour, blue-clad sentinels that lined both sides of the street observed our every move as we shuffled towards the enclosure. The atmosphere of heightened security was warranted. The 10th anniversary of 9-11 elicited a terror alert for Friday, Saturday, and Sunday and the NYPD was out in full force over the weekend. New York City’s authorities were not taking any chances. The press pen, however, was surprisingly spacious. It was standing room only and I jockeyed with cameras, microphones, and other journalists for prime pen real estate. In the end, I managed to muscle my way into a nice spot at the head of the group. The USA Today reporter to my left shot me a dirty look when I slowly eased in front of her for a better view, but I pretended not to notice. I was on assignment for the New York City Lens, a student-run news site at Columbia University. 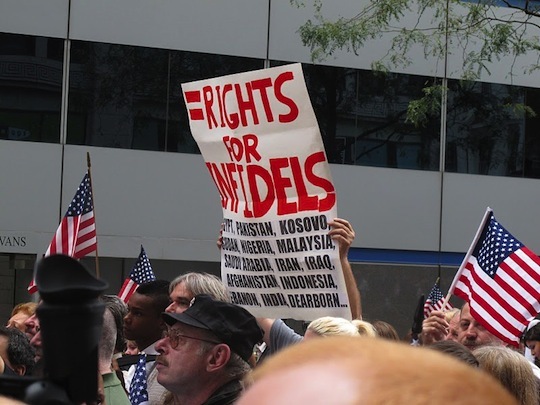 I popped down to Lower Manhattan on Sept. 11 to cover a rally by a group called, Stop the Islamization of America (SIOA). They were, by and large, right-wingers who had an anathema to Muslims and Islam. One of the highlights was recording a series of quotes from a rally attendee who called for the Christianisation of all Muslims in the name of peace. Granted, there were a number of moderates in the crowd (and many, many American flags of all sizes), but the very opinionated were also the loudest. This conviction-to-noise ratio was aptly demonstrated when the extreme right-wing Westboro Baptist Church made a brief cameo appearance before the rally started. In addition to their regular, almost comical rants about homosexuality, a number of them waved placards that read, “America is Doomed” and “Thank God for Dead Soldiers.” The NYPD shooed them away, but not before the church group sang an obscene rendition of Happy Birthday to commemorate – in their own way – 9-11’s decade-long public memorial. When I was writing for The Source in Vancouver, I never found myself covering stories that revolved around overt displays of racism and bigotry. As the paper’s English Section Editor – an honour shared with the very talented Samuel Ramos – I was always in search of story ideas relevant to the paper’s mandate. It is with a sense of relief – and maybe a bit of regret from a journalistic standpoint that I never had cause to dispatch our Source reporters to cover major events that touched on the darker aspects of living in a multicultural society. I stood in front of the podium as Pamela Geller, one of SIOA’s founders, delivered the event’s opening address. I listened and recorded the words of subsequent guest speakers, but my mind never abandoned the realization that dawned on me as Geller spoke to her audience and those of us in the press. I was finally experiencing – though not on a personal level – what “the other side” had to say about acceptance and diversity, values that many citizens of progressive Western democracies often take for granted. It was a momentary, fleeting glimpse at how quickly reactionary aspects of society can graduate from fringe status to a position that, while not quite mainstream, is nevertheless frighteningly close to it.